To be honest, this recipe should actually be called Shawarma-style chicken. The real shawarma (i.e., how they actually make it in the Middle East) is spice-marinated sliced cuts of meat, like chicken, beef, goat, lamb, and sometimes turkey stacked and cooked on a vertical spit. As the shawarma turns, the meat is cooked by a heat source that is located behind the actual spit. What’s amazing is that the meat is basted in fat and its own juices. Marinade + fat = awesome flavors. Afterwards, the cooked meat slowly falls off or is shaved with a large knife; and it is either eaten on its own or tucked inside a pita, with tahini, garlic sauce, veggies and sometimes even french fries. Basically what I did here was to make the marinade, use it on chicken and then I grilled it to perfection. Because notwithstanding being a sucker for kitchen gadgets, I currently do not have the space in my kitchen to fit a Shawarma machine. Don’t get me wrong, I’d love to own one and throw massive Shawarma parties. Unfortunately I don’t see that happening any time soon...major bummer. Back to the recipe, since I was going for a non-authentic Shawarma recipe, I decided to go fusion and serve it with avocado mayo. Like Middle East meets Mexico or something. Which for me is a big step because I tend to hate fusion food. With passion. Like if you really want to get me upset, you’ll invite me to dinner to a fusion restaurant. I really do not care for vietnamese noodles served with Bolognese sauce nor for Red Velvet fried chicken. I have limitations, I know. 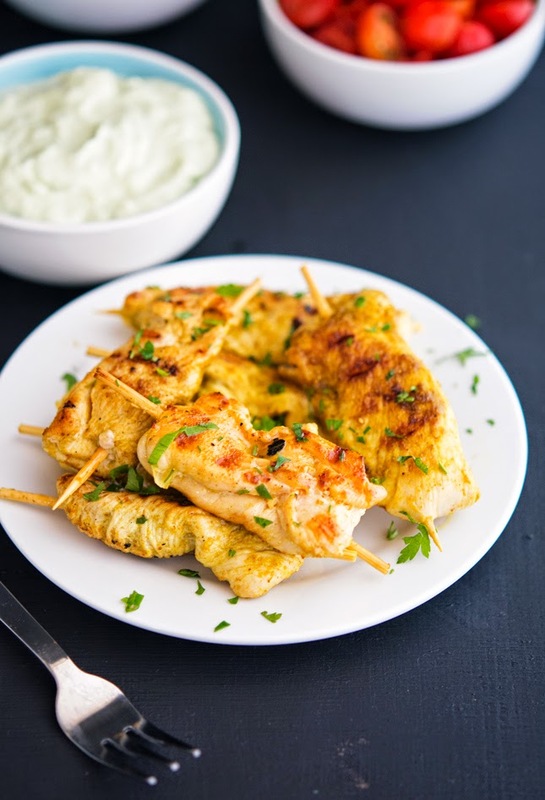 Anyways, this recipe is super yummy, the chicken bursts with flavor and goes great with the freshness of the lime avocado mayo. Apparently, fusion food sometimes works. Both the chicken and the mayo store well in the fridge, so you can make a large batch and enjoy it for several days afterwards; just reheat before serving. 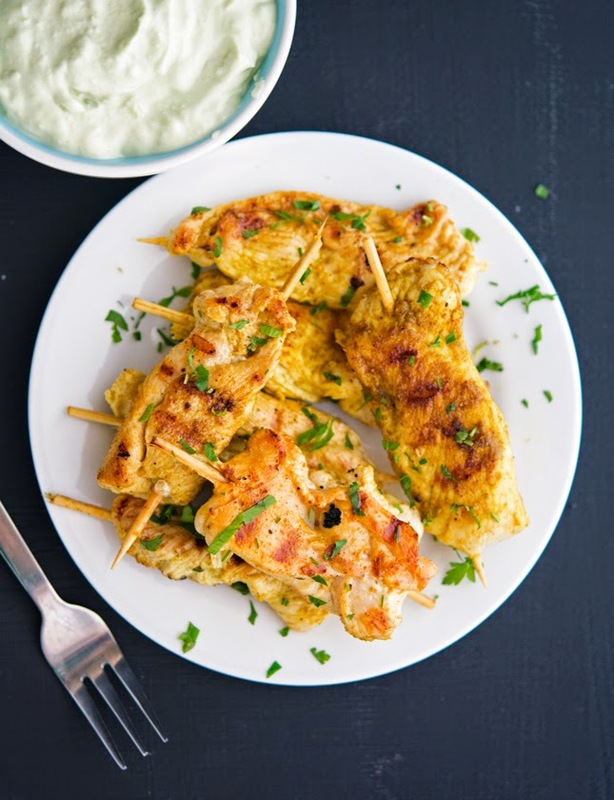 What’s really awesome about this Chicken Shawarma is that it’s ridiculously easy and quick to make. A complete no-brainer. 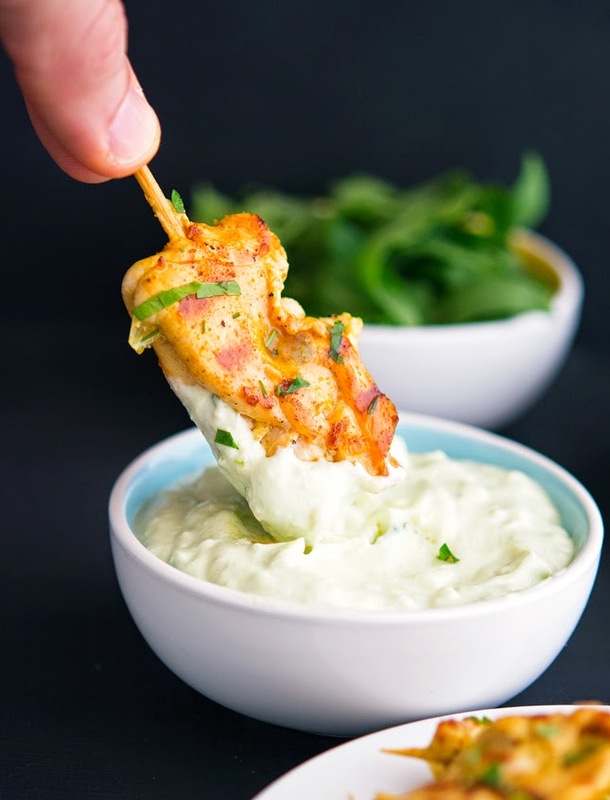 Chicken Shawarma with Lime Avocado Mayo Print this recipe! Heat a grill or a grill pan to medium-high (if you’re using an outdoor grill lightly oil the grill grates). In a bowl whisk olive oil, lemon juice, garlic, salt, curry powder, cumin and coriander until combined. In a shallow sealable container or in a large Ziploc bag, combine chicken strips and marinade. Cover or seal and marinate at room temperature for at least 20 minutes. In the meantime make the avocado mayo. In a bowl mash the avocado until smooth. Add mayo, Greek yogurt, lime juice, salt and pepper and stir to combine. Taste and adjust seasoning if needed. Set aside. One serving (dressed with avocado mayo) yields 412 calories, 28 grams of fat, 5 grams of carbs and 35 grams of protein. This looks amazing Mike, I so want to try that marinade! The marinade is da bomb Corinne, you should really give it a try! Sounds amazing. Would make fantastic party appetizers as well. It's true Lauren, the perfect appetizer indeed! The flavoring is incredible, Mike. And ridiculously easy? I am all over this this Summer. Seriously great. OKAY YOU NEED TO COME TO LOS ANGELES ASAP because I have a bazillion Lebanese Restaurants I want to take you to for the BEST SHAWARMA ON THE FACE OF THE PLANET!!!! And as I said VIA Tweet... I am going to be making Chicken Shawarma based off your recipe and another recipe for an episode of my show!!! AND I AM DEDICATING IT TO YOUUUUUUUU! That is so awesome GiGi!!! This is a very simplified version of Shawarma I'm not sure it's up to par with LA's finest, but it's pretty darn good! I'm all for letting go of authentic in exchange for accessibility! 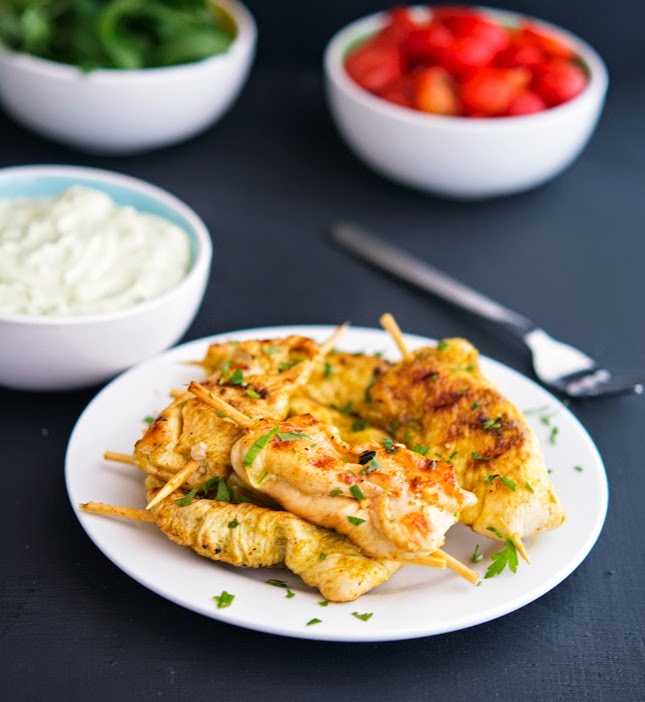 This is going on my menu plan right away - thank goodness for easy grill recipes! That's fantastic Kari, lemme know how you like it! I'm not the biggest fan of fusion food either but I would happily devour shawarma-style chicken with avocado mayo! Great recipe, Mike! I swear Bianca, in this case fusion works, for real! Hahaha, that is so funny Alli. I'm such a sucker too for typos/mispellings or weird store names! Love recipes like this Mike, I am a big fan of fusion food, I know shoot me...... but the avocado twist here sounds perfect. Good GOD, that looks delish! the lime avocado mayo sounds great! I want this is my stomach now!!! I usually shy away from fusion food as well, but I can see what you mean about these flavors working well with each other. Great share and such a bright and pretty plate. What is the garnsh? Basil? Here comes another beautiful dish from your kitchen. Light and tasty, this is the perfect plate for summer, a must try! Awwww Daniela....thank you so much! Oh boy - this post brings back all sorts of memories for me - there used to be this little canteen around the corner from where I lived as a teen in Abu Dhabi that had the best shawarma-their meets were so tender! Your chicken sounds amazing - curry, cumin, coriander are some of my favs - I can almost smell this through my computer! I've never been to Abu Dhabi (or Dubai) but I'm actually dying to go there. When I'll be planning my trip, you'll have to give me some advice. Alrighty? Anyhow, this looks amazing! I love that avocado mayo. Pinning! Thanks Mike! This was delicious with a saled :-) A yummy healthy dinner! I made this recipe tonight - crazy good! The avocado lime mayo will be making it's way into many of my future menus! Love, love, LOVE your recipes Mike! Sounds amazing! I had Shawarma for the first time at a Mediterranean restaurant last week. I'm putting this on my dinner menu. That's the kind of validation I'm after...husband humming, it doesn't get much better than that! This was FABULOUS! Thank you! Thank YOU for taking the time to let me know you enjoyed it! These flavors are amazing!!! We made a double batch of this. Had the salad recipe with them for dinner and leftovers were set up like this for lunches. The funny thing is I ended up being in an "I really don't want salad" mood. Then I tried it....wow. Love the chicken and the salad dressing. Thank you! I will make this tonight! It looks amazingly delicious. This was absolutely out of this world. I wish, I like the comment above, that I had made a double batch of this! I had my reservations when I saw how simple it was. Three spices. Some recipes I've made, there's been a whole host of spices, some the norm, some exotic, and this tasted this good with three? Just shows sometimes that it's easier to just 'keep it simple'. The avocado mayo was amazing too. That's two recipes I've made from this site this week, and both are keepers. Korean Chicken on Monday, see if I can hit a hat trick! Many thanks.